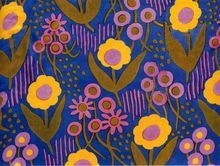 In 1911 Paul Poiret, a renowned French fashion designer, made a trip to Germany and Austria where he was charmed by the creations of the "Wiener Werkstatte". In 1912 he created his own design school, the Atelier Martine named after his daughter, to further his Art Deco ideas. 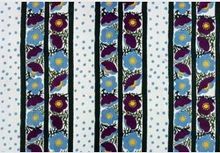 Poiret's role was "...to stimulate students' activity and taste without influencing them or criticising, so that the source of their inspirations should be kept pure and intact...." The girls' designs was fresh, spontaneous, inspired by nature . 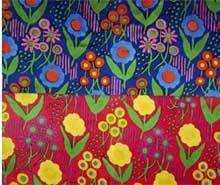 They used gouache or pastel to design colorful floral patterns. Atelier Marine's style was very influencial till the end of the 1930s. Shops were opened in Paris , Berlin, London, Philadelphia and Biarritz. 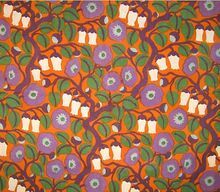 In the late 30s Paul Poiret went bankrupt and and Atelier Martine closed down in 1929. The Atelier Martine primitive and invigorating style was the talk of the town at " Salon des Artistes Décorateiurs" in 1912. The influence of the Serge Diaghilev's Ballet Russe costumes is visible here.